Jack Nicholson has five planets in Earth signs and a Taurus Sun. He has won fame showing the character traits of his fixed and sensual Taurus Sun, as well as the other primary components in his astrology chart. Physically, you can see the bull’s features in the bovine eyes, the wide nostrils, and the cowlicks on the sides of the mane (which mock the ears of a steer). The looks are there, but as we know, this is not a contented beast, calmly grazing in a field. He smells the smoke in the air and red flags of fire are waving in his face. The ruler of Jack’s Sun is Venus, and as we would expect, it’s in a fire sign—Aries. Uranus also conjuncts his Sun. These two forces give his fixed-earth solar expressions an assertive and impulsive quality. On top of this, a Mars in Sagittarius induces a scattered, fiery metabolism, that in its resulting clumsiness, warns us of the dangers of putting a bull in a china shop. Jack does not appear so stable, when he became emotionally riled. In such moments, seems to become nervous and obsessed with frivolous details; These character traits can be attributed to his Virgo Moon! 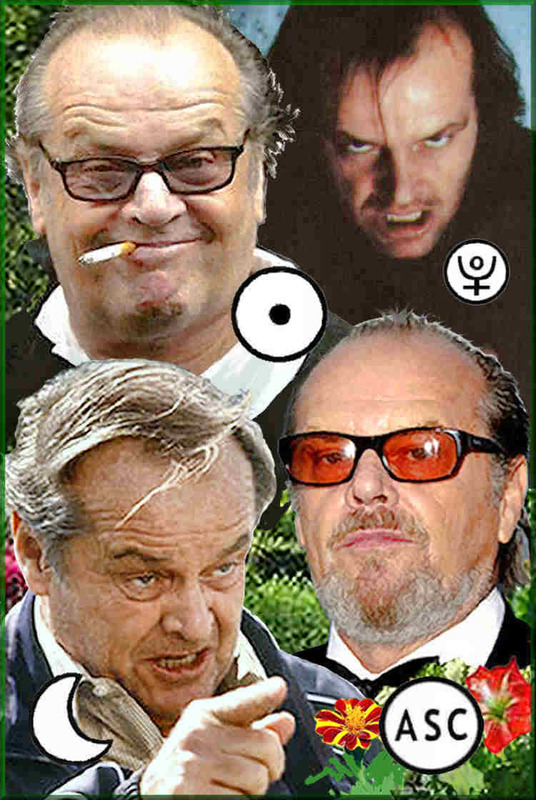 At 29 degrees Virgo, Jack Nicholson’s Moon is sextile to Pluto. Often, Virgo’s courtesy and need for perfection is cast aside, as this heavy planet drives him to take control. Recall the restaurant scene in Five Easy Pieces when Nicholson reorders his breakfast. Watch his questioning responses in Chinatown. Then there’s his movie, where Jack brilliantly displayed his lunar nature playing a hypochondriac, consumed by life’s imperfections. Picture it in your mind, and you’ll agree that this film captures the essence of a Virgo Moon. It’s As Good As It Gets. Jack also has a powerfully fixed Leo Ascendant, since his 12th House Pluto conjoins his Ascendant, trines his Sagittarius Mars and squares his Venus in Aries. Pluto ends up “empowering” all three of these fires signs. It certainly intensifies the already stubbon character traits of Jack’s Taurus personality. Notably, Pluto is in the sign Cancer and we often feel it percolating just below this theatrical facade, as it tries to present us with its’ unsettling presentation on Pluto’s deeper mysteries. In “The Last Detail”, the Leo mask was front and center—roaring to get attention! In his Oscar winning role in “One Flew Over The Cuckoo’s Nest”, he showed us a loud and proud individual, who made us wonder who was really insane. In “The Shining”, Pluto took over and left no question. When Leo rises, the eyes turn from bovine to feline as the jaw juts out to reveal once hidden jowls. In the moment, Jack holds the fire to purr and preen—to assure himself that everything’s in control. With Pluto just below the surface, you feel that you’d better not mess with this kitty.